West Cheshire College sports student Danielle Lowe is counting down to the start of the Glasgow Commonwealth Games on July 23 after securing a place in the England swimming team, writes Paul Offord. The journey to the Commonwealth Games has not been an easy one for Danielle Lowe. 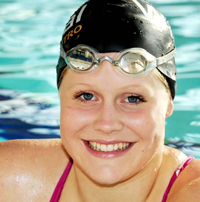 She feared she would have to give up swimming for good after contracting glandular fever in September 2011. She was unable to swim for the next year but gradually eased her way back into training from September 2012. Danielle started a level three sport and exercise science BTec at West Cheshire College in September 2013, which she passed last week with distinction. The 19-year-old managed to combine her studies with a rigorous training regime which allowed her to prosper three months ago in the national trials for the Commonwealth Games taking place from July 23 to August 3. Danielle secured the honour of representing her country in the 400-metre individual medley and 200-metre breast stroke, after finishing second and third in the trial finals for each event. She said: “This will be my first senior international meet and I’m very excited. “I have worked so hard to get to where I am today. I train for five-hours-a-day, six-days-a-week so I’m delighted it has paid off. “I was determined to do well at college too. Danielle has been swimming competitively since she was 10 years old. She competed aged 14 in 2009 in the European Youth Olympic Championships in Finland, finishing fourth for her age group in the 100-metre butterfly, and aged 16 in 2011 in the European Junior Championships in Serbia, finishing joint-fifth for her age group in the 100-metre butterfly. Danielle secured a scholarship when she was aged 16 for Millfield School, in Somerset — where she could train in the private school’s pool and study for A-levels. But she was forced to leave within six months after contracting glandular fever, followed by bouts of tonsillitis and chest and sinus infections, which led to her missing the national trials for the 2012 London Olympics. Danielle praised West Cheshire College for the role it played in helping her return to top form. She said: “The college was as supportive as it could possibly be. Mr Hilton, programme leader for sport, said: “We are so proud of Danielle. “She is extremely dedicated to swimming and very talented. Danielle and her sisters Amy, 17, Emma, 20, and Stephanie, 21, were raised by their single-mum Michelle, 44. She said: “My mum has always been my number one fan, sitting in the stands watching me. “Obviously, it has been quite difficult for her being a single mum-of-four, but she has always managed to juggle everything so she can drive me here, there and everywhere to train and compete. Her mother has even dedicated a room in their family home, in the Wirral, to all Danielle’s swimming medals and trophies. Danielle achieved all of this despite suffering with asthma and a skin allergy to chlorine. Danielle will start a foundation degree in sports coaching in at the University of Derby in September.